I get asked all the time why I don’t watch Family Guy. It’s one of the most popular TV shows for the young adults and its one of the most commercialized shows in America. It has 2 spin offs. And Seth MacFarlane, the show’s creator, is a great voice actor and occasionally writes up a song for the show. By this logic, it seems Family Guy may be one of the best shows on TV. However, that’s far from reality. The thing I don’t like about Family Guy is that is poorly written. The characters are thinly drawn, and the jokes never have anything to do with the plot. This doesn’t mean Family Guy isn’t funny. I’ve seen quite a few episodes that have gotten a laugh out of me. But funny doesn’t equal good. And Family Guy is so filled with jokes, the writers don’t care whether they make sense to the plot or not. Many people compare Family Guy to The Simpsons, which angers me a great deal, because many elements of Family Guy have been stolen from The Simpsons. Peter Griffin pretty much is an exact clone of Homer Simpsons, except whereas Homer has a friendly nature, Peter is just plain mean. An episode of South Park, “Cartoon Wars”, pretty much sums up Family Guy by showing the show’s writers as manatees grabbing balls with random jokes inscribed for the show’s script. For example, “Laundry” + “Date” + “Winning” + Mexico + Gary Coleman becomes a clip of Lois asking Peter to do the laundry, after which Peter recalls winning a date in Mexico with Gary Coleman. Though just a joke, that pretty much is the formation of Family Guy’s gags. 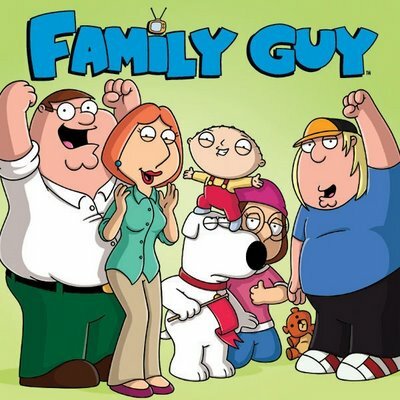 MacFarlane’s other show, The Cleveland Show, had a little bit more promise than Family Guy, because Cleveland is a more likeable than Peter Griffin. But in the first 20 seconds, it becomes pretty much a black and less funny version of Family Guy, making fun of black stereotypes and having just as many random jokes. Out of the three of Seth MacFarlane’s shows, American Dad is the best, because it doesn’t have Family Guy’s random joke system, and actually has drawn out characters. Don’t get me wrong, it’s no Seinfeld, but it’s distanced itself from Family Guy. If only Family Guy’s writers actually took time to do their work. The show could be better if it were more formulated or developed. But until then, Family Guy just remains a stale joke-delivery sitcom.